You are here: Home » Pope encourages reading Bible ‘by any means’ including mobile phones and tablets! 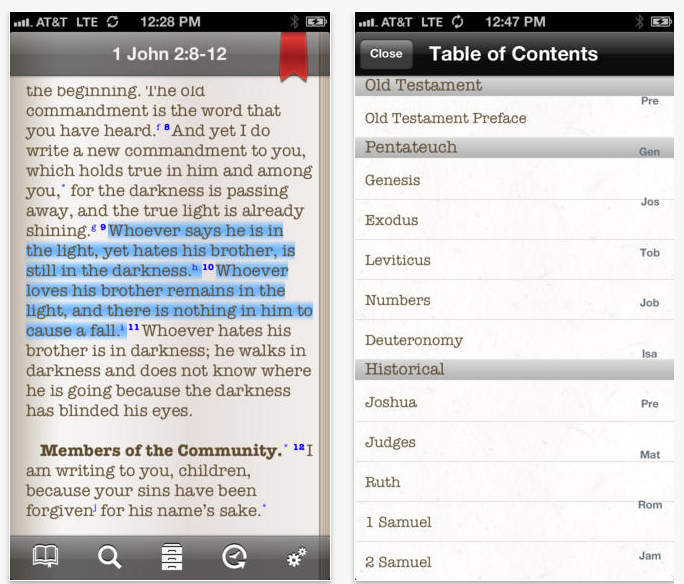 Screen shots from iMissal Bible showing highlighting and easy navigation menu. Note the footnote links for lightening-speed access and a bookmark capability. The parchment background for the elegant reading font gives a touch of the sacred to the overall appearance. Okay. If that’s not a high enough celebrity endorsement for using a Bible app, what is? If you don’t have a Bible on your mobile device, consider that Easter is a fantastic time to give yourself this gift. We make recommendations for several versions of Bible apps which you can choose among depending on your preference for translation, device platform and price. Yes, an entire Catholic Bible can be loaded onto your smart phone or tablet in seconds for as little as $0.00. Free. Hesitant to read such a large book on your little device? Most Bible apps actually offer a pleasant reading experience for most users. First of all, developers have made great efforts to make the text look and feel traditional and sacred with their choice of text fonts and backgrounds. Pinch/zoom and flexible text settings in most Bible apps allow you to bump up the text and change color or backgrounds for easier reading. Navigation is a breeze in the many Bible apps we’ve tried. And, depending on the app, you can easily highlight text, create bookmarks, write imbedded notes and even Facebook, Twitter or email the verses you select. Some come with reading plans and on-line Bible study communities you can join or form. Looking for something with a little more substance? Our Bible app recommendations include the most technologically advanced Bible study apps which come loaded with various Bible translation editions and a host of resources bundled in. These resources include concordances, dictionaries, commentaries, verse finders, ancient Hebrew/Greek translations, medieval texts, teachings of the Church Fathers and much more. This technology actually speeds up the study process as your “library” inside these apps can pull up resources in seconds to cross-reference verses; pull up commentaries on passages; look up footnotes; search topics; find verses etc. The important thing, as the Pope reminds us, is to read the Word of God, by any means – “read the Word of God; it is Jesus who is speaking to you!” Here’s a video of the Great Gospel Give-away and Pope Francis’ words of encouragement to carry the Bible with you everywhere!